This is the third discussion in a “book club” series on Born to Buy by Juliet Schor, which focuses on consumerism issues and young children. You can jump back to the first discussion if you’d like. This discussion covers the second half of the second chapter starting at the subheading ”Playing Less and Shopping More,” including pages 29 through 38. This section of the book really got me thinking about my own family and the behaviors we choose over the course of an average week. I tend to think that in many way we’re the typical American family except lighter on the television and heavier on the reading. But is that good enough? This section really made me reconsider that a bit, pointing me in the direction of some fascinating studies. Let’s dig in. In 1997, the average child aged six to twelve spent more than two and a half hours a week shopping, a full hour more than in 1981. […] They spend as much time shopping as visiting, twice as much time shopping as reading or going to church, and five times as much as playing outdoors. […] More children go shopping each week (52 percent) than read (42 percent), go to church (26 percent), participate in youth groups (25 percent), play outdoors (17 percent), or spend time in household conversation (32 percent). 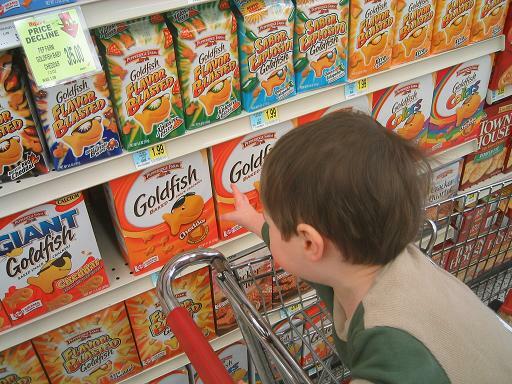 He sees ol’ dad tossing lots of stuff in the cart, so he looks around for stuff he might want as well. The colorful packaging looks interesting and the item looks tasty, so let’s grab it! This is obviously an opportunity for some basic consumer education, but wouldn’t he get more out of life if the kids stayed at home with one of the parents, played, read some books, and took a nap while the other parent went to the store? Shopping is a mentally engaging activity and it’s often hard to distinguish why people are putting stuff into the carts – frankly, I often can’t comprehend the stuff my wife puts in the cart. Given the complexity of a large grocery store, what lesson will a two year old take home other than “grab some things, put them in the cart, and take them home”? It might be better to shop with him a little less and read with him a little more. Taken together, these findings are not comforting. They how that American children are worse off today than they were ten or twenty years ago. This conclusion is especially notable when we consider that during the past fifteen years, child poverty fell substantially, from a high of 22% in the late 1980s to its current rate of 16%. The decline in child poverty should have led to improvements in measures of distress, because child poverty is correlated with adverse physical and psychological health outcomes. The deterioration of the well-being indicators suggests that some powerful negative factors are undermining children’s well-being. In other words, there’s statistical evidence of some significant negative shift in the physical and mental health of children over the last thirty years or so, but at the same time child poverty (the usual cause of poor child health) has gone down. My belief is that this is a more universal phenomenon than just a children’s phenomenon. Obesity rates have gone up like a rocket over the last thirty years among adults – just look at this obesity trend map. Not only that, depression rates are steadily increasing as well. Along those same lines, child mental health issues often follow into adulthood, meaning children with psychological problems such as depression often grow into adults with those same problems. With more children suffering psychological ailments than ever, it follows that there will be more adults with psychological ailments. This really reinforces that there’s a significant problem at work here, and I’m looking forward to digging into that problem through the remainder of the book.